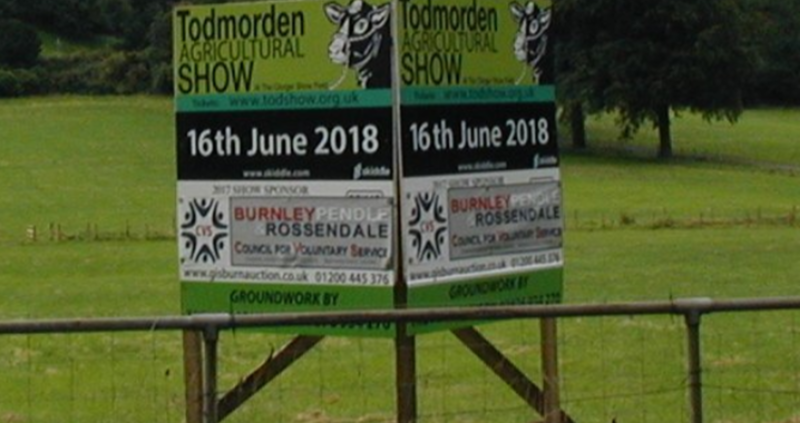 Todmorden Agricultural Society relocated the show in 2017, to a new site next to the Ram Inn on the A646 in Cliviger. The result was an equal if not more successful event due to extra parking being created for visitors. The site is well situated adjacent to the main Burnley to Todmorden road and comprises of 28 acres of parkland with free on site parking. 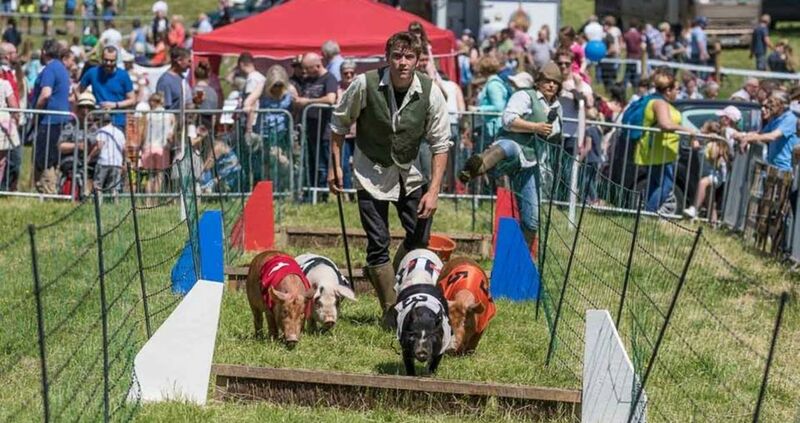 The society spends in excess of £40,000 to host the show with comprehensive schedules for Horses, Cattle, Sheep, Goats and small animals with a full line-up of special attractions in the events ring. A fifteen minute subsidized Bus Service for visitors will be running throughout the day from both Todmorden and Burnley bus stations. All other inquiries please contact the show secretary using the form below. ALL applications for trader stands will be via Event Owl so that our small volunteer team can concentrate more time to attracting visitors and planning the event. 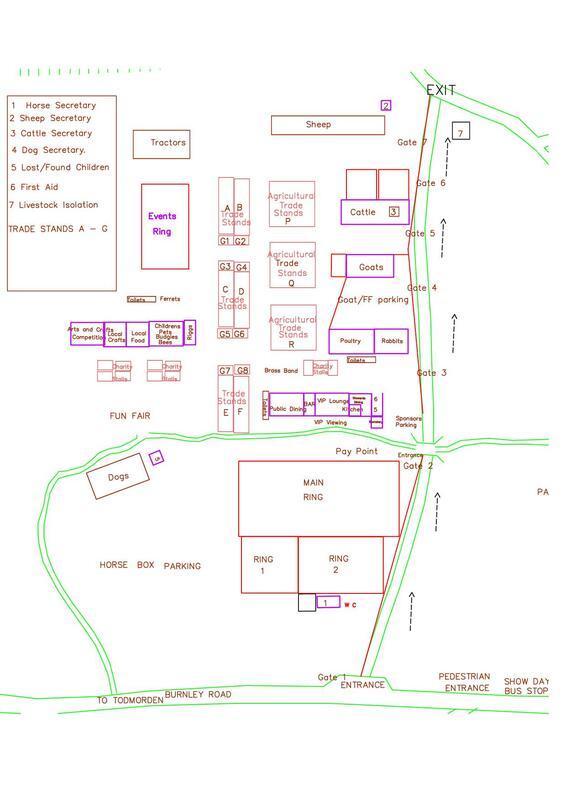 Please refer to the Simple Guide under Exhibitors in the navigation bar. They are aware that some of our Exhibitors may not have used an online system before and are ready to help you get started. Those with larger stands should seriously consider setting up on this day. All stands should be ready to trade at 9.45am. All exhibitor vehicles not part of the stand, should be removed from the site and parked up in the car park. No trader shall breakdown stand nor remove from site before 5.30pm or when our Stewards allow movement of vehicles on site. All rubbish produced by your stand MUST be taken home with you. All stands to be broken down before 12pm when our volunteer clean up team and marquee companies will arrive. 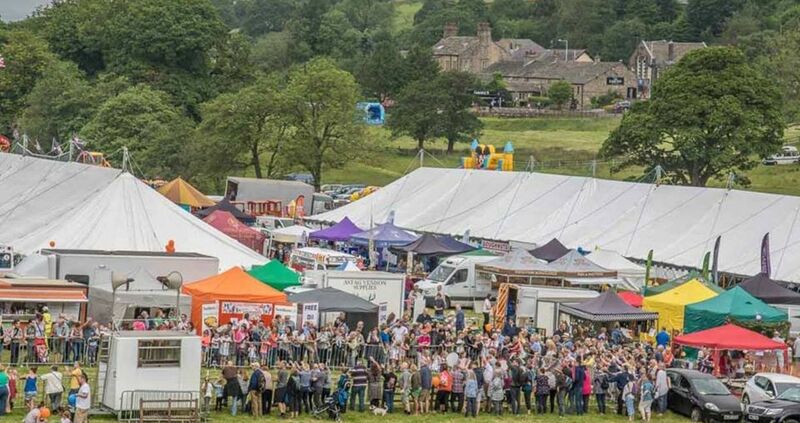 Arts, Crafts and Food and Drink Halls - priority will be given to local traders within 15 miles of Todmorden. All traders in these halls will be allocated a table on arrival. Charity stand applications: will be allocated a pitch in advance by the trade stand secretary. You will then receive an email confirming your exact location. All stands must be ready for spot check inspections by our Health and Safety Officer by 09:30 hours. All vehicles off site by 09:45 hours. 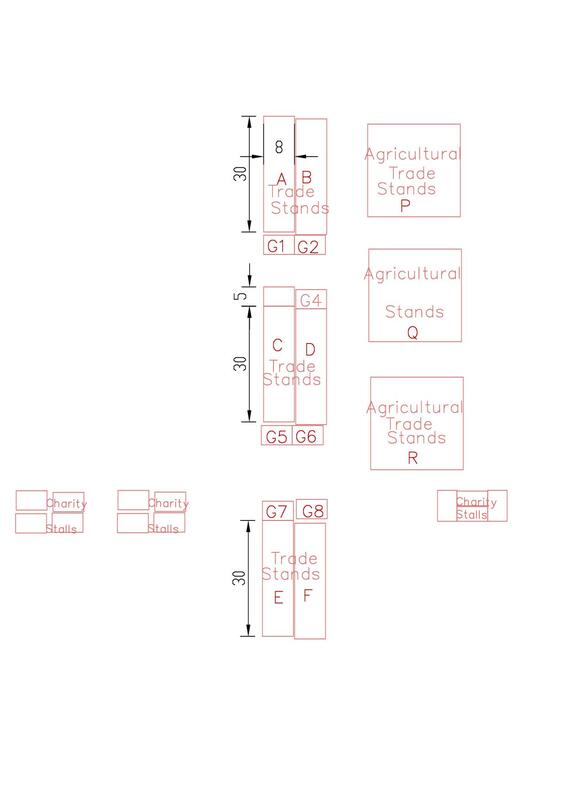 Exhibitor Tickets will be issued on a 1 for 1 x 6ft Stand, and 2 for 3 meters of frontage basis. Extra tickets may be purchased with your application. 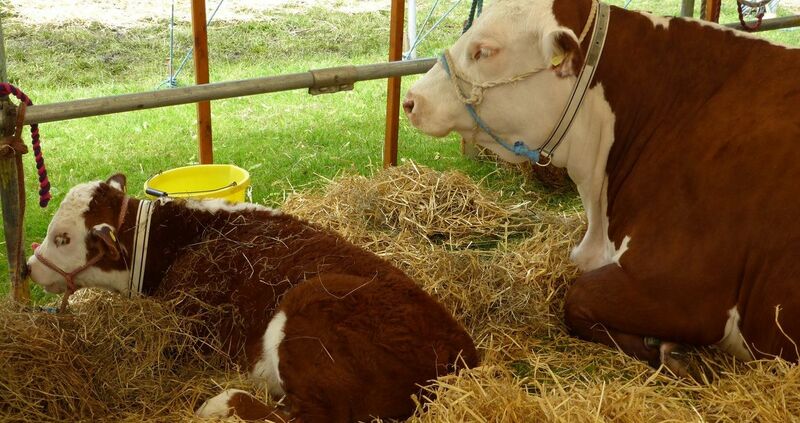 All traders, less those in the Arts, Crafts, Food and Drink Halls, must bring their own cover/gazebo. Alcohol traders will require a TEN's license form Burnley BC if approved. Due to an agreement with the main bar provider only applications from traders selling alcohol for off site consumption will be considered. Please note - no electricity or water of any description is available on site. A 25% deposit scheme option is available. Please select your option at checkout, and the order will adjust. Balance due payment date - 14th April 2019. CHANGES: This year some stands are priced on meters of frontage. Type the number of meters of frontage you require in the box, the depth will be displayed. Own gazebo required. No electric or water of any description is available on site. 6ft table in large marquee with no table cover, room behind for storage, small pop up banner. We are only looking for bespoke, home made crafts not mass imported added value products. To book more than one stand simply type in the number of stalls you require in the box. No electric or water of any description is available on site. 6ft table in large marquee with no table cover, room behind for storage, small pop up banner. We are only looking for bespoke, home made foods and drink, not mass imported/added value products. To book more than one stand simply type in the number of stalls you require in the box. No electric or water of any description is available on site. For artisan producers only. Own gazebo required. NO FOOD FOR IMMEDIATE CONSUMPTION e.g. pies sold hot/cold must take a Cold or Hot Food trader pitch. No electric or water of any description is available on site. E.g cold pies, salads, ice cream, sandwiches, cold desserts/­snacks. Own gazebo required. 3m depth maximum. Multiple side by side pitches for the same products/dishes being sold may be booked. Includes Ice Cream trailers.No electric or water of any description is available on site. E.g warmed pies, small doughnut trailers, coffee trailers, sandwiches, hot desserts/­snacks. Own gazebo required. No electric or water of any description is available on site. Tow hitch to be included in dimensions. E.g. those selling fast foods such as burgers, pizza, hotdogs, curry, fish and chips served from a self contained trailer mounted kitchen. Space is premium. All relevant certificates MUST be uploaded with this application. No electric or water of any description is available on site. All traders will receive two free tickets plus one car pass per 3m frontage). These tickets are IN ADDITION to your total pitch allowance. Generators must meet HSE standards, be silent and carry the current test certificate on the day of the show.